It’s probably true that professional basketball players take the most pride in adulation from their peers and former players because those are the only people who truly know the type of perseverance it takes to succeed at the highest levels of this game. The Golden State Warriors are one of the most talented NBA teams of all time, and there’s a serious debate to be had regarding which player is the best on the team. Kyrie Irving is one of the premier point guards in basketball, and given how many times he faced the Warriors in the NBA Finals as a member of the Cleveland Cavaliers, he’s especially qualified to make an assessment as to who the best player in their lineup is. 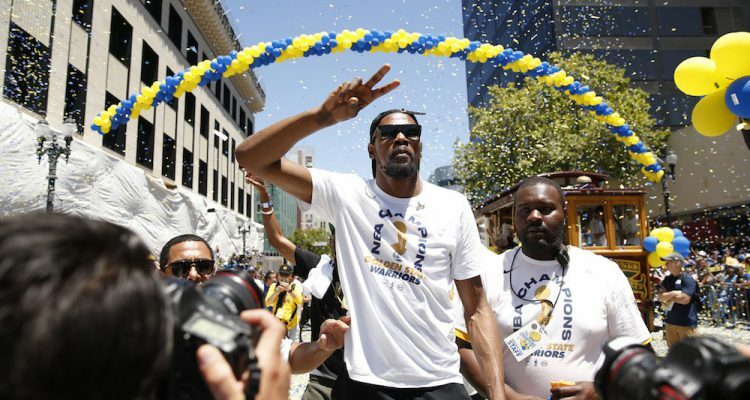 During an appearance on “The Bill Simmons Podcast,” Irving told Kevin Durant’s critics to lay off him for making the decision to join the Warriors. Irving also acknowledged that yes, the Warriors are a great team, but Durant has become the best player on that team. The notion that he’s in any way coasting for championships on a great team doesn’t make sense since he’s the one leading the charge in terms of statistical production. Irving also defended Durant’s decision to join the Warriors simply based on the fact that Durant had the freedom to control his experience in the league. Making a choice in free agency to appease outside perspectives isn’t a good idea since they’re not the ones who’ll have to face the repercussions (either positive or negative) of that choice. Irving connected the Durant decision to his own choice to demand a trade away from the Cavs during the 2017 offseason. Irving said that he made the choice he felt he had to make in order to be true to himself, and that it doesn’t really matter what anybody else thinks regarding his decision. There are two main points to elaborate on regarding these comments. The first is whether Durant actually is the best player on the Warriors. The second is the nature of the relationships between players and management and fans. While Durant is probably the best player on the Warriors, there’s a serious argument to be made that he’s not their most important player. After all, this core Warriors squad won a championship without him. He was just the piece that elevated them to stratospheric levels. The beauty of the Warriors is that each of their four superstars plays such a vital role that a compelling case could be made for each being the most important player. Durant is obviously one of the most prolific scorers in NBA history and possesses athleticism that still doesn’t seem realistic for someone his size. Stephen Curry is the true leader of this team, and his scoring skills mesh with his orchestration ability to fuel one of the most dynamic offensive attacks in NBA history. Draymond Green is the heart and soul of the Warriors. He might be the most versatile defender in the NBA and is such a fantastic facilitator on the offensive end. Klay Thompson can catch fire like very few people who have ever played the game. He’s also an invaluable defender who’s often asked to neutralize the opposing team’s most explosive perimeter player. They’re all crucial to the success of this team, and when one or more of them have a bad showing, the others are fully capable of elevating their performances even more. Durant might be the most talented player overall on this team, but it’s not definitive that he’s their most important, which speaks volumes about how truly unbelievable this team is. As for the discussion about players being able to determine their destinies like Durant and Irving did and if they owe anything to people beyond themselves and their friends and families regarding those decisions, players should, in fact, make decisions with mainly themselves and their loved ones in mind. While people enjoy living vicariously through these athletes, it’s truly their own lives, and people need to be able to guide their choices based on what’s right for them at that moment in time. Athletes are often forced into unnecessary obligations based on a sense of guilt that very rarely gets fully reciprocated from the other side. In this case, the other side is team management and fans. A player is asked to be loyal to these two groups while these groups can conveniently escape responsibility for upholding that same value. For example, management can trade a player at any time. Notice how loyal management is to a player if they feel they can maneuver them to improve the team. Management is only loyal towards the goal of winning, and rightfully so. Doesn’t it make sense then that a player also be loyal to winning more than to management? Team management looks out for themselves and it’s applauded. A player looks out for themselves and it’s vilified. If a player demands a trade from an organization, there’s this strange sentiment that percolates within the fanbase that the player is selfish, because they’ve supposedly quit on the team. Why isn’t the same thing said when a team essentially quits on a player? If a player’s production slips, the team will probably get rid of them. There is never as much moral outrage when players are discarded by a team as when a player seeks to leave a team for any reason. Let’s even say it’s not a performance issue. Maybe the team wants to move on from the player because they don’t mesh with other players on the roster on a personal level. If that’s okay for management to do, then why isn’t it okay for a player to demand a trade because they have a personal grievance with team officials? There’s just so much more expected of players for whatever reasons. Those possible reasons could be analyzed compellingly enough to write a senior thesis on the subject. The uneven relationship and the double-standards on display between players and fans are perhaps even more stark, though. The devotion of fans to players is proportionally linked to how talented and productive that player is out on the court. Fans will ask that players not “betray” them by leaving as free agents. Look to see if those same fans will advocate for a huge contract for that player if they begin to decrease skills or become injury prone, though. Observe the Durant example in Oklahoma City. They didn’t want him to stick around so badly because he’s a decent person. There are bench players who are as genuinely decent of people that fans didn’t feel betrayed by when they left. They felt attached to him because he’s one of the best players in the world and wanted him to keep using that talent for the franchise they root for. Fans have a bad habit of objectifying players and forgetting that these figures are actual human beings with thoughts and feelings and families and friends. They far too often view these players as walking 3-point Shots and breathing Rebound Machines existing for the sole purpose of entertaining the masses. Yes, fans pay money to see these guys play, but the players have fulfilled their end of the bargain and delivered a fantastic product to them. It just seems bizarre that so much more moral responsibility is put on the players than the other actors involved in these relationships. When guys like Durant or Irving show a desire to leave a team, that team’s fans are really just upset because the team they like is going to get worse because of it. Interesting that a player is supposed to be loyal to a team during their All-Star years, but once their performance slips that same loyalty isn’t returned to them, and there’s never a debate as to whether it should be. It’s a welcome development that players in the league seem to be coming to these realizations in such large numbers. Everybody has a right to the pursuit of happiness. Players are taking charge of their careers and making the right decisions for them and their families. Irving is absolutely correct when he says that it doesn’t matter how fans view his trade request from the Cavs. If given the opportunity in their careers to go work somewhere else more enjoyable for them, these fans won’t think twice about jumping ship for another company in their own life. These players are rich and famous, but basketball is ultimately a job for them. They have the right to make informed business decisions in the same way people in other fields do. The Durant and Irving criticisms are misguided, at least to the degree to which they are expressed with such frustration and hatred. It’s one thing to personally disagree with their choices, but it’s an overreach when the character of these players are attacked so viciously. It doesn’t make an athlete a bad person to leave a team, no more than it makes a fan a bad person to want a player gone when the player’s production drops. It’s just important that logical consistency is maintained while assessing these relationships. It’s not fair for players to be held to a stricter standard than fans and management.